Composed by Sigfrid Karg-Elert (1877-1933). 20th Century, Recital. Score, Set of Parts. 12 pages. Published by Austin Ralphson (S0.89401). 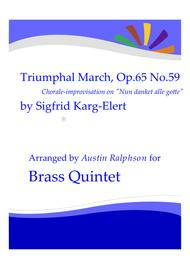 This is a brass quintet arrangement of Sigfrid Karg-Elert’s Triumphal March, Op.65 No.59. It is a chorale-improvisation on "Nun danket alle gotte", originally for organ. The piece is very impressive indeed on brass and is ideal for weddings or as an impressive concert piece.Please listen to the mp3, performed by the Liverpool Brass Ensemble, for a better sound. Apologies for the dodgy start!